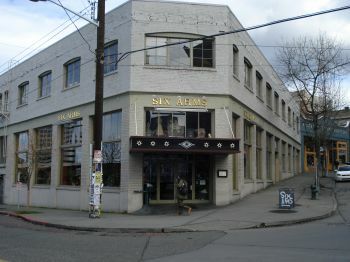 Six Arms is a cool brewery in Seattle. I stopped there with some friends the night we flew into town and visited because it was the only brewery within walking distance of our hotel. 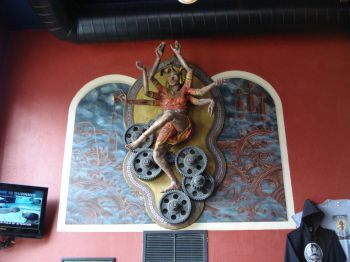 It's got a cool interior vibe, with an interesting piece of pipe art and a copper topped bar. The selection of beers covers a solid range of flavors and styles. The food there was also quite good - I ordered a steak wrap and was very happy with it. This was a short cab ride from the business district. It has a long L-shaped copper topped bar. It is two stories with a balcony overlooking the bar area. Spirited and crowded for a Monday evening. This place has a unique & fun atmosphere. For some reason it reminds me of a 1970â€™s type bar, I canâ€™t put my finger on it, but something is retro about this place. They have a friendly staff that was quick and efficient. They were very quick to hand out samples. I did not eat on this visit but will on my next. Check this joint out! 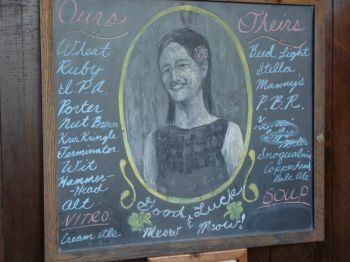 If you don't know about McMenamin's beer, hotels and clubs, you should. They cover the Pacific NW from Seattle south to Roseburg in Southern Oregon with 55 brewpubs & hotels, 35 in the greater Portland area alone! Not bad for a coupla of ex-hippie brothers who started with one pub in 1983. According to its own website, "older brother Mike, a recent Oregon State grad, recognized that Oregon's standing definition of a pub was stale. The local tavern scene -- dark, smoky, male-dominated and hard-drinking -- was a far cry from the all-age community pubs, cafes and piazzas that marked the landscape of Ireland, England, France and Italy. Over time, we've learned that what makes a good brewpub is the journey to get there." And "fun" they said, was the key ingredient. 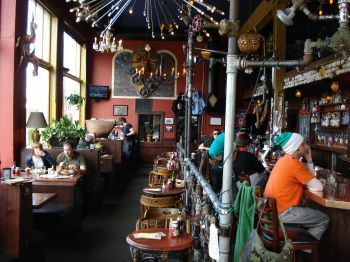 After visiting all 88 brewpubs in Washington State (and getting ready to start in Oregon) I too have learned that the journey is fun...but the reward must also be a place of fun and, just as important, a feeling of community...and let me tell you, McMenamin's delivers. I've tasted better beer in smaller pubs in even tinier towns...the axiom here being; the smaller the burg, the better the beer...but I've never discovered any place more infused with the spirit of family. McMenamin's opens their arms and welcomes you as family for as long as you wish to hang around...and makes you sad to leave. The staff is trained well, the service impeccable, the history of the places fascinating. Each has its own personality and the McMenamin brothers have succeeded in making it a necessity for wife Persimmon and I visit them all. 6 arms just on the outskirts of downtown Seattle holds a special place for us - it was the 1st McM's we visited and were treated not only to their delicious Terminator Stout but perfect, and I mean PERFECT tator tots. That's right! No french fries but tater tots...hot, crispy and cajun-spiced on the outside, soft and potato-y inside. Combine that with the iron grill works inside, Johnny Cash on the jukebox and the nearby neighbors welcoming you with a smile and offer to buy a round...do the words, "We'll be back...and soon" ring out for you?